Timorese are incredibly hospitable, gregarious and some of the friendliest you’ll ever encounter. Celebrations held at national and community levels are many and vibrant. Timorese society is also conservative and traditional with a strong focus on family, the community and religion. With a population of just over 1.1 million, Timorese are linked closely. At the same time many indigenous groups exist, each with its own language and cultural practices. Tetun is the largest of these accounting for approximately 25% of the population. They live around Dili, Suai and Viqueque. Mambae make up a further 10% and are found in the central mountains. Other groups include the Kemak, Bunak and Fataluku amongst others, each accounting for 5% or less. Timor-Leste (East Timor) has many spoken languages reflecting past migration, colonialism and other occupation. Tetun and Portuguese languages have been given official status, with Indonesian and English considered working languages. Another fifteen or more indigenous languages also are spoken. The capital of Dili is a modern developing city offering a wide range of services and amenities for residents and visitors. While many Timorese are drawn to the capital seeking employment, 70% still live in rural areas. These Timorese mostly reside in small towns and remote villages and practice a subsistence fishing and farming lifestyle. Around 90% of Timorese identify as Roman Catholic and the remainder mostly as Protestant, Muslim and Hindu. In spite of this, animism continues to be a persuasive force in most peoples’ everyday lives. Observing the way animist and religious beliefs are seamlessly blended is one of the interesting aspects of holidaying in this country. 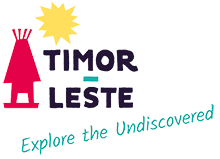 Timorese cultural heritage is multi-layered – a fascinating combination of traditional Timorese, Portuguese, Chinese and Indonesian influences. This permeates their local architecture, cuisine, clothing styles and artistic endeavors. Timorese culture continues to evolve in local arts and handicrafts, as well as in dance and music. Cultural motifs, both old and modern, are incorporated into the design of tais – hand-woven textiles, basket work and wood carving. Cultural groups still perform traditional dances and songs and also are entertaining in new ways. Talented Timorese bands and dance groups perform in local venues and at festivals. Timorese participate in a wide range of sports, including football which they are extremely passionate about.